SPRING LAKE – Brighton’s Allyson Geer ended the week the way she had made it through the week – by making a pressure-packed putt. This time is was an 18-footer for birdie on the first hole of sudden death at Spring Lake Country Club, and it lifted her over Muskegon’s Hailey Hrynewich in 19 holes Friday afternoon and made her the champion of the 99th Michigan Women’s Amateur Championship. “To win my state amateur is such an honor,” said Geer, a home-schooled American Junior Golf Association (AJGA) All-American who will turn 17 on Aug. 15 and is committed to joining the women’s golf program at Michigan State University in the fall of 2017. She had a 3-up lead in the championship match through 12 holes in large part due to three birdies, but Hrynewich, a 20-year-old Ohio University golfer and runner-up for the second time in the state championship (2013 to Christine Meier), battled from behind. Hrynewich squared the match at the par 5 17th with a par when Geer hit a third shot over the green into a bunker and played to bogey. At 18 Hrynewich made a stunning up-and-down par save from being the green to force extra holes, and just missed holing out a birdie chip from just off the green on the first playoff hole. “I hit what I thought were perfect iron shots on 18 and on 1 in the playoff, and I didn’t get birdie chances out of them,” Hrynewich said. “They both bounced off the back. It’s the breaks of golf but hit those shots pin high right where I wanted them and I played as hard as I can. Hrynewich is off to play in the U.S. Amateur in Oregon at Portland Golf Club before going back to Ohio U., and Geer will go back on the AJGA national trail. Geer said the memory of that last putt and the other clutch putts she made during the week will give her great confidence on the national circuit. Geer had to get past a fellow Brighton golfer, Hannah Pietila, in the morning semifinals. Pietila, a University of Tennessee golfer that Geer admitted she has admired for a long time, fell victim when Geer made a birdie at the 17th hole to fashion the 1-up win. 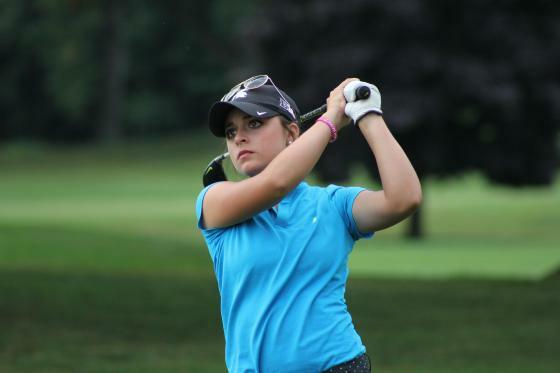 Hrynewich, meanwhile, took an early lead on struggling Sarah White of Caledonia, the recent Michigan Junior Amateur Champion, and held on for a 4 and 3 win to make it to the final match for the second time in in three years. Geer, who won round of 16 and round of 8 matches in part because of huge birdie putts on the final holes, said her father Brad, who caddies for her, played a key role in the championship. The final match play bracket can be found at www.gam.org.